September is upon us, which means it’s the start of football season. Football (soccer) in England started the second weekend in August, now for this American, real football starts the first day of September. And for me, that means Iowa State University will be taking the field against South Dakota State. For so many years I sat back with a silent hope that this year it would be different. That Iowa State (the Cyclones) would be better than last year. Then by the end of the year they would be lucky to have won three games. Three wins and nine loses was a good year. Then 2017 happened. 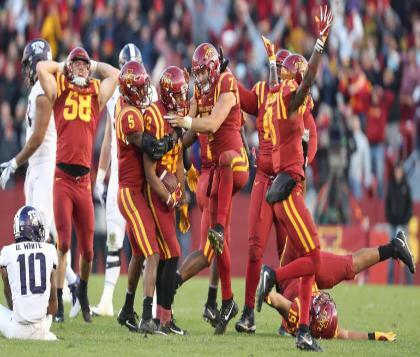 The Cyclones beat the number 3 team in the nation – Oklahoma. They followed that up with a win against the number 4 team in the nation – TCU. To say it was good year was an understatement. They won 8 games while losing 5. Those 8 wins equalled the total wins for the previous three seasons. As an Iowa State fan, to say I’m excited for this year would be an understatement. What is impressive with Iowa State is that they don’t get the best high school athletes. The five star studs don’t want to go to a school that doesn’t have an impressive history of winning games or going to major bowls. The coaching staff have to evaluate talent that others don’t see. To put it simply, they need to find diamonds in the rough. More impressive than the wins has been the “process” to get to this point. I put process in quotes because their coach speaks about it often. The idea is if you work the process, if you love the process, than the process will love you. What is the process? The team has another slogan they use. Win in the dark. The idea being that when the lights are out and no one is watching is when the process starts. As players, they need to eat right, get the right amount of sleep, lift weights, run, and stay in shape. The process also means being a good student. Every phase of your life must be part of the process. It must be clean, it must be pure. When this is accomplished then playing football becomes part of the process. Then when they are out in the lights and their fans are cheering them on, they become one, not only with the process, but also with each other. They know what they should do. They are not expected to grow from a three star player to a five star player. They are expected to be the best three star player they can be and to trust that their three star teammate is also being the best they can be.